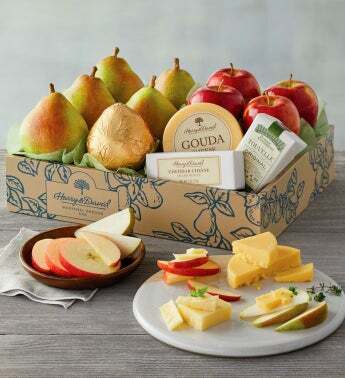 The Deluxe Pears, Apples, and Cheese Gift is among our most popular fresh fruit gifts and combines expertly grown, handpicked fruit with several gourmet cheeses, including gouda, cheddar, and the artisanal TouVelle® cheese from our neighbors at the Rogue Creamery. An American original, the buttery TouVelle® cheese features flavor notes of sweet cream, roasted nuts, and vanilla. This gift is a delicious snack pairing made in heaven.